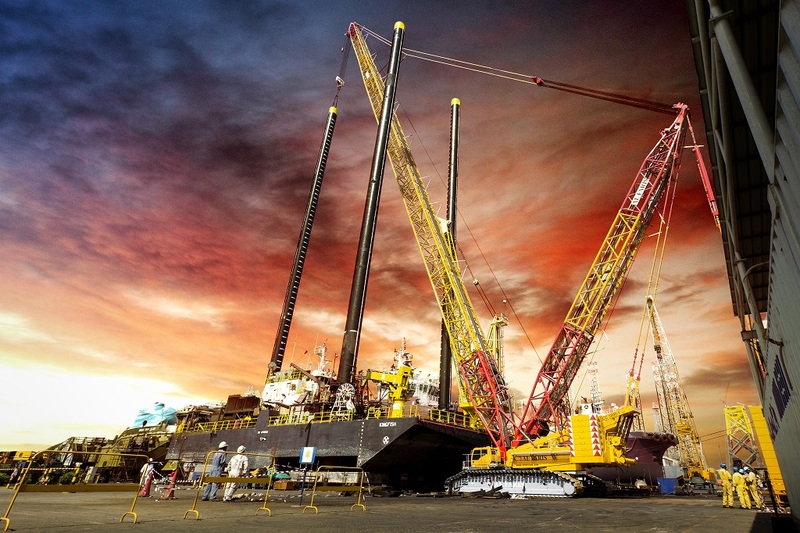 UAE-based crane service provider Al Faris dispatched a team to Hamriyah, at one of the biggest shipyards in the region, to lift three 72-meter-long, 130-tonne spud legs from a barge – a job that not only required a powerful crane, but also the right touch. The Demag CC 3800-1 proved to be the perfect machine for the project. “Once we determined all the required parameters for the three lifts, we decided that our CC 3800-1 was the best possible fit for the job,” says Hillary Pinto, Founder and Managing Director of the Dubai-based Al Faris Group, when explaining why the company decided on this crane. However, the unit first had to be transported to the work site. The company’s own lowbed trailers needed a good ten hours to complete the 82-kilometer journey from the Al Faris location in Dubai Industrial City to the work site. Al Faris’ own all terrain cranes were used in order to set up the CC 3800-1. At the work site, Al Faris used 10 of their specialized team members to get the crane ready to operate. The team decided on a configuration with a 108-meter-long main boom and a Superlift mast with a length of 36 meters. The central ballast totaled 50 tonnes, the Superlift counterweight 325 tonnes, and the counterweight on the superstructure 165 tonnes. Once set up this way, the CC 3800-1 was ready to lift the three spud legs, (having a gross weight of 130 tonnes each), at a maximum radius of 50 meters, swing them to the side, and then set them in place with the help of a 150-tonne crawler crane. The CC 3800-1 only used 68% of its available rated capacity for the lifts. The Superlift Split Tray proved to be especially useful for the project. This tray makes it possible to easily uncouple the counterweight when it is no longer required for the ongoing job, so that the crane can then move only with the Superlift counterweight that is still needed. “This clever quick coupling technology helped us save a lot of time at the shipyard,” Hillary Pinto reports while adding that he is extremely happy with the CC 3800-1’s performance in all other aspects as well. Mr.Pinto has words of praise for his team as well: “Setting up the slinging gear at a height of around 80 meters is an enormous challenge that required a lot of skill. Both, lifting and setting the unwieldy steel structures was quite an impressive feat.” Fortunately, the weather played nice at all times and there were no space issues at the large shipyard facilities. The Al Faris team was also thankful for the support provided in person by a Terex Cranes engineer – as well as for the manufacturer’s assistance before planning started. “These services are something we really value when it comes to the after-sales support provided by Terex Cranes. Especially because the communication channels are very direct,” points out Hillary Pinto, who considers this to be another important reason why he relies on this manufacturer’s products and service.